If you believe that the commodity bull market is in play, then I would highly avoid shorting treasuries. It is more likely for the 30-year us yield to fall below 2% than to rise above 4%. Assuming QE continues, look at what QE has done to rates in the last few years. Yes, rates should be higher, but they aren’t due to artificial demand. I believe you’ll find it more difficult shorting treasuries rather than just buying high grade corporates over the next five years. Earnings should fall, as well. Hussman preaches this with excellent historical, statistical data. Tiho has a lot of good points as well. Point being, multiples could compress dragging stock prices lower, which treasuries have been an incredible hedge against this. Thanks for your comments. It’s the secular transition. I am playing for a final push in commodities. 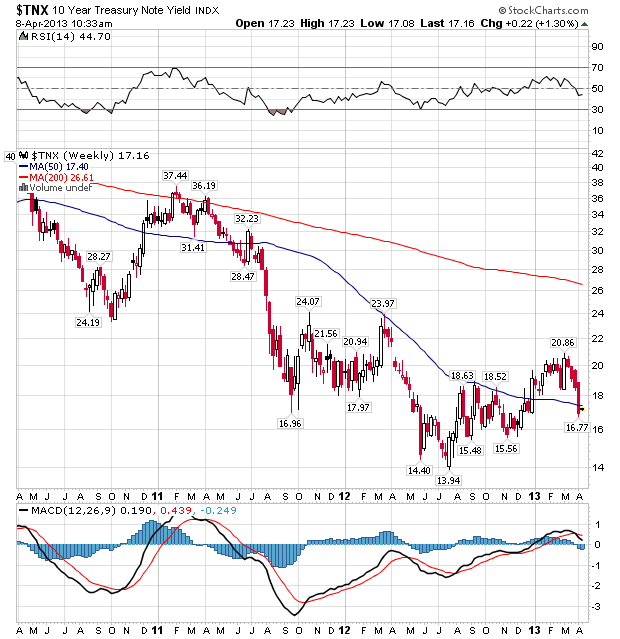 Treasury yields should rise for the stocks cyclical bull to end. 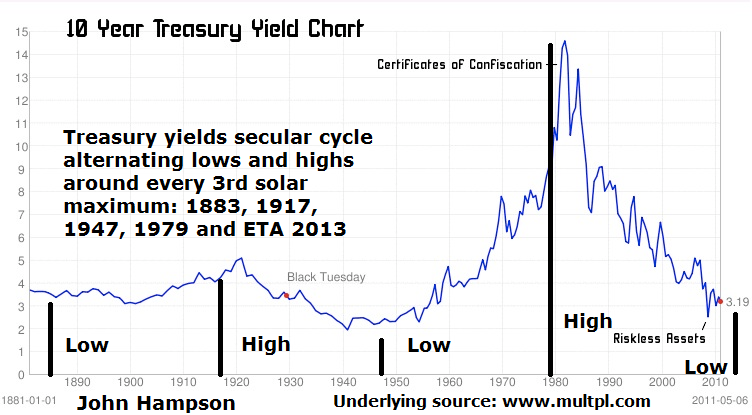 A new secular bear in treasuries is being born around this time. The earnings chart that shows US corp profits at a record percentage of US GDP is a red herring, as US comps are now global. Hussman’s fund has made an average minus 4.5% return each year over the last 5 years, and just 1.65% over 10 years – I know he remains popular, but those woeful returns should make it crystal clear that it is dangerous to follow his analysis. Here in the US some so-called economists and GOP politicians already warned in 2010 against Bernanke’s QE1 as highly inflationary, bond-killing etc. They were completely wrong yet none ever apologized. Instead Ryan’s budget is built on top of this proven nonsense. 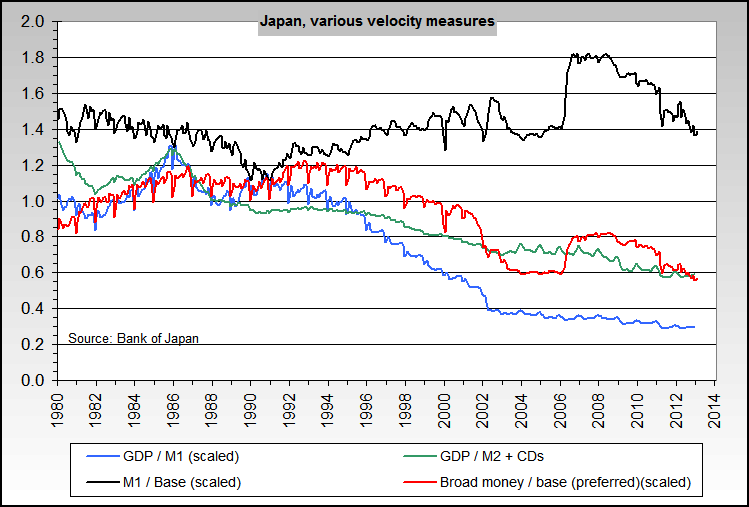 The Keynesians claiming that in a liquidity-trap situation low rates, low growth, low inflation and high unemployment would persist until a massive joined fiscal and monetary stimulus is engaged (of the magnitude of the Lend-Lease act 1940) have been proven right so far. With German-dictated and UK self-imposed austerity the situation in Europe is even more dire, almost desperate. I’m just waiting for the next Hitlers to come up there. Anyways until a massive fiscal and monetary stimulus is engaged, the current low everything except for high unemployment and desperation situation will continue I’m afraid. 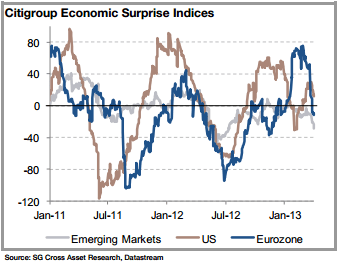 Depends whether you see the cycles dominant or the central banks. I see a normal cleansing cycle / secular bear / K-winter and evidence of a secular transition now under way. I see the central banks as tweakers. If they had have intervened less we would have seen a more ruthless deeper cleansing and more social disorder. But growth would have resumed regardless following this. Exponential technological evolution will be at the heart of a new cycle of growth. All models updated this morning. A new geomagnetic uptrend is developing into May. May-July is seasonally a positive (i.e. benign) geomagnetic period historically. Sunspots have picked up to a level not seen since January. 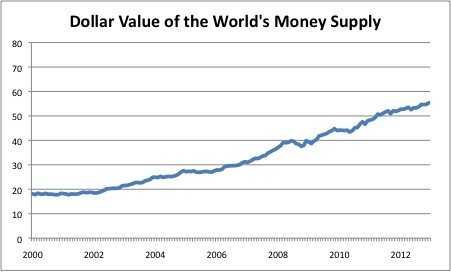 If we compare it to the world money supply chart, then we see that money supply has not gone up much more than the GDP. Both have more than doubled from 2000 to 2011. 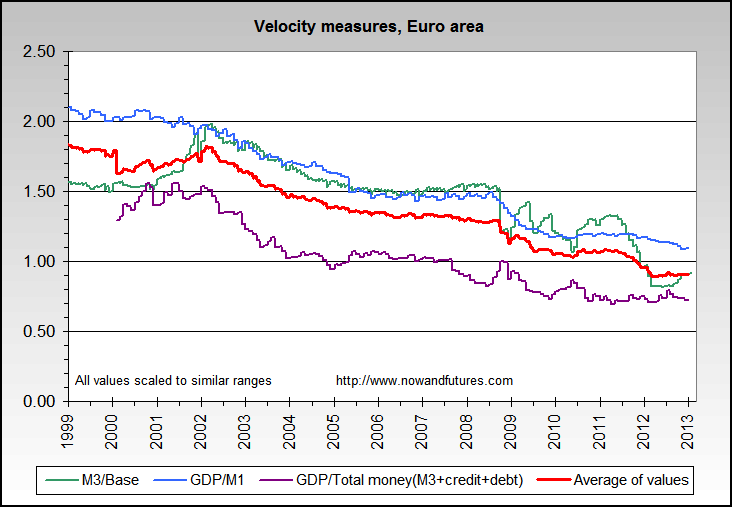 Basically, there is money destruction whenever a country or bank fails or when bad loans are written off. They have tried to compensate for that with money creation aka QE programs. That has kept things “stable” but is not going to create real growth. Real sustainable growth can only come from people earning more, so that they can spend more. 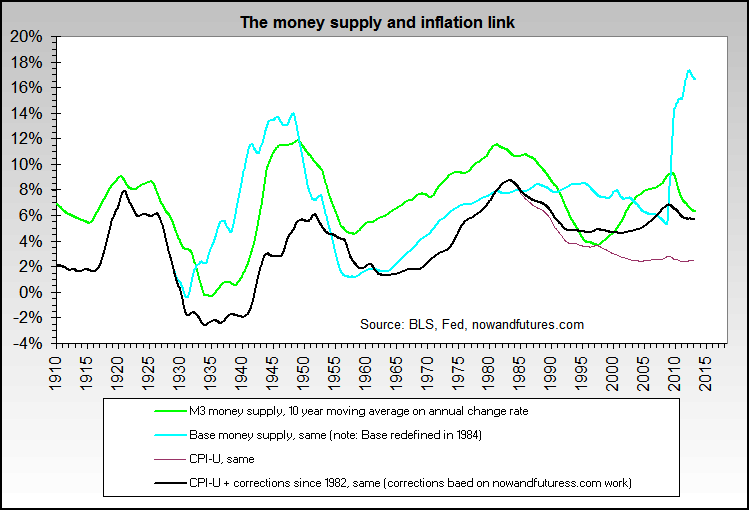 Inflation has typically come from labor shortages and/or high capacity utilization (bottlenecks). We currently have neither: the employment rate is very low and unused capacity in the economy remains high. Most metals have very high and rising warehouse levels, showing oversupply. Mines were built when prices were high and now they are producing. That means it will take several years of strong economic growth before these oversupplies will dwindle. Parabolic rises are typically only seen when warehouse levels become very low. Danny, I do appreciate your challenges and your information – thanks again. I need to consider this and your other comment. Then a new post. Well, I think research and articles should never be taken at face value and challenges and criticism are always needed to improve theories. So, I am doing my best. Sometimes a certain aspect is being overlooked, or certain “evidence” may be suffering from confirmation bias. Not rarely that will be more evident for the readers than for the author. That’s why the direct interaction that blogs facilitate those days can be so useful. 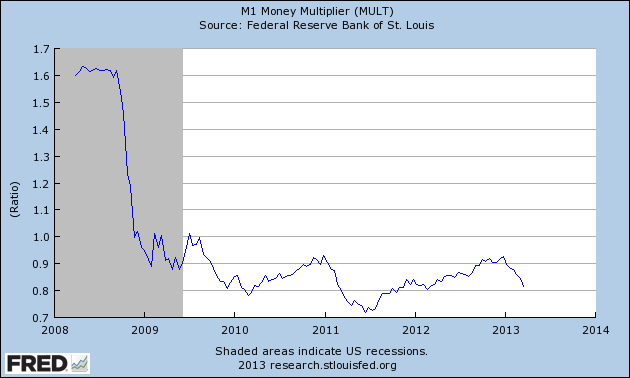 Money is less liquid because it is stagnate, we can liken it to being in a big freeze with occasional melts over the last decade. The hoarding of cash may be fear based I agree. “This shows the lack of confidence in growth and a persistence of fear.” Sounds so Scorpionic. I’ve been thinking about Danny’s view point as well for a time. What will ignite inflation? Came across this article yesterday on hyper inflation: http://www.theatlantic.com/magazine/archive/2013/04/my-hyperinflation-vacation/309263/ So, I’m reminded that there are many types of inflation. Hyper, Wage, Price, Asset and Commodity etc… If (price) inflation means too many dollars chasing too few goods then those dollars need to get into the hands of people who will/need to spend the money at the same time that supply is outstripped… I can only envision this happening tied to some type of fear based reaction of some magnitude in response to something like war, drought, natural disaster, more financial crises etc. Planetary cycles suggest a spike in inflation… but it better get a move on or the match that lights the fire will blow out. The Nodal axis currently joined by Saturn in Scorpio may be more like lighting a wet match in the wind. The over hang from extending poor credit can be with us a while longer…and lenders take a while longer to ‘pay it forward’ (government intervention). Watching the 36 year cycle of Saturn-Neptune suggests we’ve only made a down payment on the crisis. 1989 to 2007 to 2025 conjunctions culminate at the World Point. 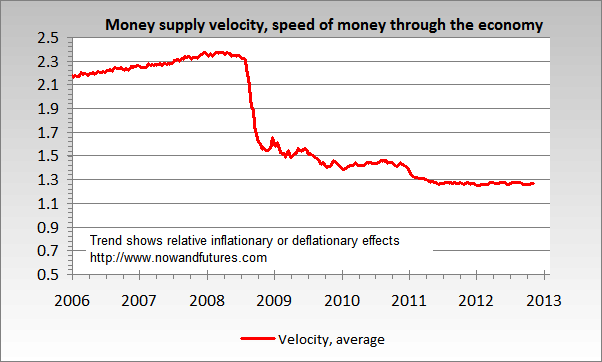 HVA, that definition of inflation: too many dollars chasing too few goods, is actually very useful. The implication is that two conditions need to be met to get serious inflation: 1- too many dollars AND: 2 – too few goods. While one could make the case that there are too many dollars for the moment, it is clear that the second condition is not fulfilled. There is no shortage in any “goods”, actually there is a glut in most things. And that’s why we don’t see inflation despite all the QE. Even China’s inflation rate is down to 2% from 4% last year. Also, let’s say you don’t trust cash and think the currency is going to be debased even more. What are you going to do to get rid of your cash? Well, I think hoarding perishable “goods”, or filling the basement with sugar and canned tunafish, or storing a few tons of zinc in your garage, are not going to be your first choices. The inflation that “could be” is now happening in the stock and bond markets, rather than buying sigarettes, bread or firewood, the only available options in the days of the Weimar republic. The question becomes: how will that play out further down the road? Great work, John, so that your main scenario is already bullish in Us stocks for a while? or have seen the top last weeks? 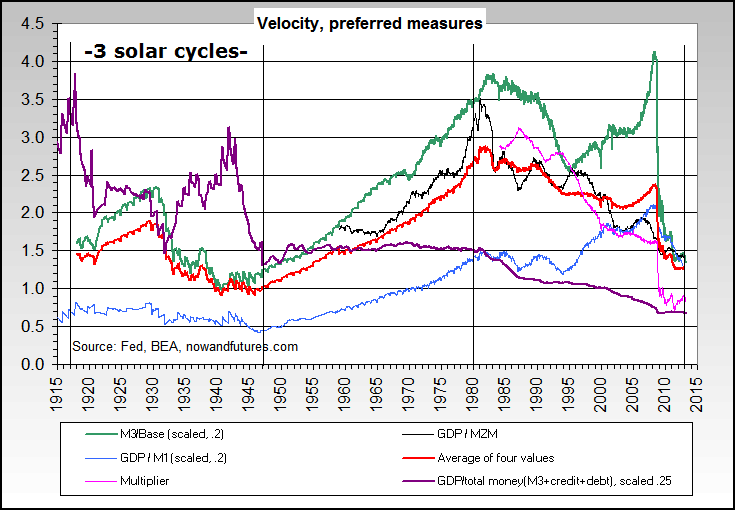 and the solar cycle peak would leave in the end of 2013 or begining of 2014 in new highs in basic materials, hiperinflation and bond prices falling down? As I wrote sometime, not always the solar peak matches with all time hihgs in Commodities? Could be a pwerful rebond. Still place the greater probability with the scenario of stocks making a cylical top by mid-year, commodities outperforming and making a secular by late 2013 or H1 2014, bonds to retreat, inflation to peak (no hyperinflation). The alternative is that stocks are already in a secular bull and commodities in a secular bear.